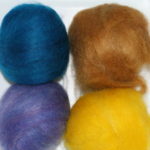 Description: Hand dyed before carding. Description: This is a yearling ram fleece with nice lock structure and 4inches in length. This is a washed fleece, with very little VM. It is not super soft but has a nice medium crimp and is springy. 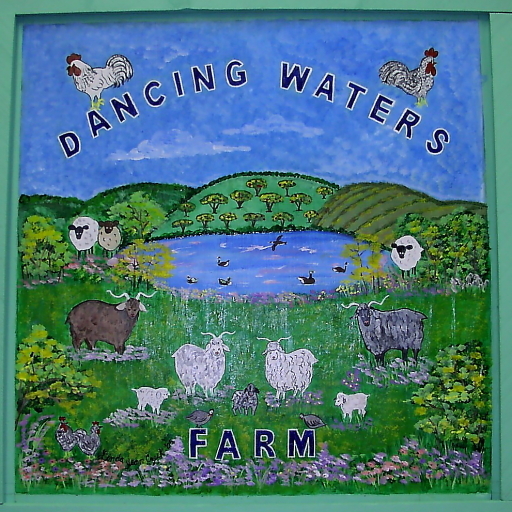 Description: Hand dyed and then carded at Dancing Waters Farm. 50% adult mohair, 50% Shetland wool. Description: This is a beautiful fleece in shades of medium brown/grey with good lock structure. It has been washed and has almost no VM. 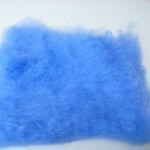 The Coopworth has a medium fleece, so does not have a super soft feel. Would be great for weaving or for knitted outer garments. The Coopworth is a relatively new breed (~1950-1960) created in New Zealand by crossing Border Leicesters and Romneys. 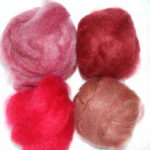 Description: These are gorgeous hand spinner fleeces due to their softness and color variation. Spin direct from the fleece as carding would destroy the color changes within the fleece. These are washed fleeces, that still contain a bit of lanolin and are ready to spin direct from the fleece. Sheep: Constance – shades of medium brown and cream as well as white. Beautiful crimp and lock structure. 1.94 pounds washed, small amount VM – SOLD. Pershia – shades of grey from nearly black to pale grey. Beautiful crimp and lock structure. 2 pounds washed, small amount of VM. 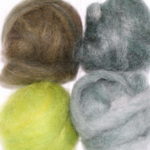 Veil – light to medium grey, very soft and crimpy. Not much lock structure remains as the fleece was picked to remove most of the VM. 1.5 pounds washed, small amount VM – SOLD.